There was an article, some kind of ‘lost classic’ thing, on the final page of a 90s music monthly, about this album, which was the first time I’d ever heard of it. I knew of Isaac Hayes as the guy who’d done Theme From Shaft, and he might have already been the voice of Chef from South Park (which started in 1997), but I knew pretty much nothing else. 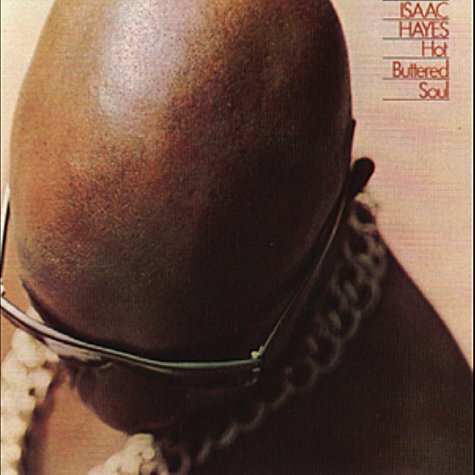 The title of the album, and its obtuse cover (the top of Isaac’s bald head, his face hidden), were immediately intriguing, and the description, of an avant-garde album, made by a backroom producer and writer (Sam & Dave have him to thank for Soul Man) given complete creative control by a record label (Stax) recently split from its home (Atlantic) and floundering to find its own identity, sealed the deal. I had to have this album. Hayes debut album, Presenting Isaac Hayes, had been a bit of a flop and he was going to step behind the scenes again, when the split from Atlantic meant Stax lost their entire back catalogue. Stax executive Al Bell decided to release 27 albums and 30 singles on the same day in a crazy attempt to construct an instant back catalogue, and Hayes used this opportunity to make an album where he had the final say on everything. It’s pretty fair to say that the resulting LP is a singular vision. At 45 minutes long, there are only four songs, two of those spectacularly elongated covers of recent (now deemed classic) hits by other people. It opens with Bacharach and David’s wonderful Walk On By, stretched to breaking point at 12 minutes in length, lavished with an ornate, psychedelic soul orchestra, sparkling guitars and the most insistent, physically demanding rhythm section imaginable. The final three minutes or so lock into an unbelievable groove, the volume waxing and waning in intensity as the band play harder, softer, harder, but keep the pace constant. An edited version was a hit, and has been sampled countless times, but you need the full experience, really. It’s one of my favourite musical experiences ever. Next up is a 9-minute funk / soul workout, one of two original songs, with a ludicrous title – Hyperbolicsyllabicsesquedalymistic – and another outstanding groove, this time the rhythm adorned with piano (remarkably house-like at points). Again, it’s been sampled plenty (including on Black Steel In The Hour Of Chaos, apparently). The other original is a (prototypical, but very good) soul ballad called One Woman, which plays things pretty straight and comes in at about 5 minutes long. The album closes with an extraordinary 18-minute long cover of By The Time I Get To Phoenix, the first 8 minutes of which are a spoken-word introduction, where Isaac talks about how great the song is, how he’s going to do his own take on it, and about the power of love and moral weakness. Obviously. Tom Listened: Whilst I am still a little confuzzled as to how this comes to be labelled ‘avant-garde’ (sounded pretty straightforward to my ears) I really enjoyed about 3/4 of it. The best track was Walk on By and, once I managed to put Nick’s ever more exaggerated gyrating to the back of my mind, I came to see what he was on about in his introduction to this record. An amazing slab of sound and, somehow the guy twiddling the volume knob in the studio didn’t even get in the way of my enjoyment of this track (which was almost as good as the Stranglers version). I liked tracks two and three a lot too, but found my attention wavering on the first 10 minutes of By The Time I Get To Pheonix which I felt was unnecessary and bewildering – it’s one of the best songs ever written, why would you do that to it? But, all in all, a great listen and an album I intend to pick up at some point. Rob listened: I’m familiar with some of this record from soundtracks, and have a couple of Isaac Hayes’ later records. I love the sound and of course the sheer shameful indulgence of a guy being able to stretch his songs out over as long as he likes is somehow thrilling. I’m glad we didn’t get into a discussion about the definition of soul music. It would have done none of us much credit. However, i’m not sure something as outre as this can quite be it. But then we did get into a discussion about the definition of ‘Avant Garde’ during which I demonstrated comprehensive cluelessness, so what would I know? Graham listened: I also struggled a bit with why this album may be regarded as ‘avant-garde’ and “By the time ……”, was interesting, bordering on murdering a great song. But the main thing was I loved the rest of it. The extended instrumentals sounded like great live jams that had been put down on tape, and in moderation, there is nothing wrong with that. A whole area of music I have never really consciously avoided, but just seem to have ignored. Not for much longer!